When I read the book, The Invention of Hugo Cabret by Brian Selznick, The Station Inspector was hardly my favorite character in the story. 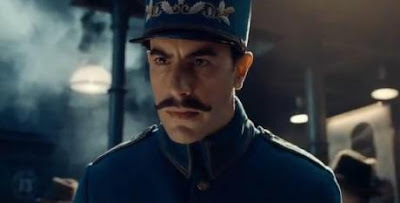 That being said, The Station Inspector is certainly one of the most enjoyable characters in the film Hugo, thanks to Sacha Baron Cohen. I was nervous about his role in the film. Would he turn The Station Inspector into Borat (for the purposes of Cultural Learnings of America for Make Benefit Glorious Nation of Kazakhstan). Yet, while Cohen most definitely brings his unique brand of comedy to the character, he is simply hilarious. My favorite scene by far in the film is when Cohen is attempting to smile in an attempt to win over Lisette (Emily Mortimer). The physical comedy of the awkward smiles (remember, he says he's master three smiles), is comical pleasure in a film that certainly is not marketed (or presented) as a comedy. Cohen does an incredible role in supporting the main action carried by child actor Asa Butterfield, and a part of a wide and diverse ensemble cast. I expect no accolades for Cohen's performance, but I have to think that many people will walk away thinking that he's one of the true joy's of this film.